On April 25, 2018 the Supreme Court of the United States heard oral arguments for the landmark case State Of Hawai’i And Ishmael Elshikh vs. Donald J. Trump, et al in which the State of Hawaii sued the federal government to stop the implementation of Executive Order No. 13,780. The executive order, which is titled “Protecting the Nation from Foreign Terrorist Entry into the United States.”, is President Trump’s third attempt at a travel ban and it restricts the entry of foreign nationals from 6 specified Muslim countries and two non-Muslim majority nations (Libya, Iran, Somalia, Syria, Yemen, North Korea, Venezuela and Chad). Chad was later removed from the Travel Ban on April 11, 2018. It also suspends entrants from the United States refugee program for specified periods of time. The case was first filed by Hawaii Attorney General Doug Chin and then joined by Imam Ishmael Elshikah of the Muslim Association of Hawaii. Along with lawyer Neal K. Katyal, they argued that the executive order violates the Immigration and Nationality Act, the Religious Freedom Restoration Act, and the Administrative Procedure Act and is unconstitutional because it favors one religion over another in violation of the establishment clause of the First Amendment, it denies equal protection of the law on the basis of national origin, it curtails the right to travel without any legal justification, and because it deprives individuals of their liberty interests without due process of law. The concept that the Executive Order is islamophobic is due to a now deleted statement on the Trump campaign website published December 7, 2015, “calling for a total and complete shutdown of Muslims entering the United States until our country’s representatives can figure out what is going on.” as well as multiple other instances of President Trump calling for the Mosques to be shut down, a Muslim registry to be created, and for Muslim individuals to be surveilled. 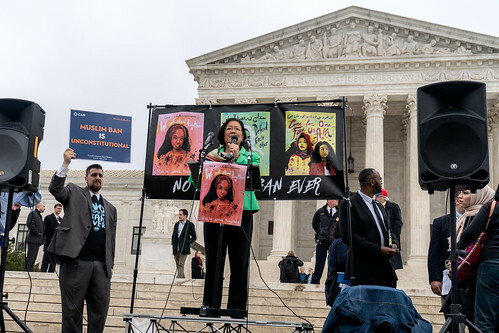 Solicitor General Noel J. Francisco, representing President Trump and his administration, argued that ban, which was described by the President as a “Muslim ban”, was in fact a travel ban. He emphasized this by stating “This is not a so-called Muslim ban,” he said. “If it were, it would be the most ineffective Muslim ban that one could possibly imagine.” It excluded, he said, “the vast majority of the Muslim world.” In addition, he pushed for the notion that “This proclamation is about what it says it’s about: foreign policy and national security.” and that it had been created and reviewed by the Presidential Cabinet in order to address national security concerns. In an attempt to distance the executive order from President Trump’s past islamophobic statements, Francisco asked the court to disregard any islamophobic statements Trump made before he was elected as being irrelevant as prior to taking office because he was a private citizen. “ Are the plaintiffs’ claims challenging the president’s authority to issue the Executive Order reviewable (“justiciable”) in federal court? Does the president have the statutory authority to issue the Executive Order? Is the global injunction barring enforcement of parts of the Executive Order impermissibly overbroad? What motivated the implementation of the Executive Order? In their questioning of the argument, it appears that a slim majority of the Justices are hesitant to set the precedent of allowing courts to determine whether a potential national security risk is valid and therefore seem likely to uphold the Executive Order. Adding to the belief that the Supreme Court will uphold the travel ban is that they allowed the Executive Order to go into effect in December while they reviewed the legal challenges to it. Strikingly, Justice Kennedy, whom many believed could be a swing vote in this case, pressed Mr. Katyal about whether judges should have the authority to question a president’s national security judgments by inquiring “That’s for the courts to do, not the president?”. If the Executive Order is upheld, it will be in distinct contrast from the rulings of the the U.S. Court of Appeals for the 9th Circuit in San Francisco and of The U.S. Court of Appeals for the 4th Circuit in Maryland who declared the travel ban unconstitutional. The court will issue its decision by the end of the term in June. See past Declaration 17 updates on the Travel Ban.